There is one sure way to be able to enjoy a large meal and a spot of wine without putting on an weight... exercise. The cyclotour du Leman 2009 ! And to summarise the result, we are now back home near Epalinges, sipping some rather ample glasses of wine and smiling smugly to ourselves having successfully cycled the 180Km race in about 6 hours, plus the extra 15Km or so to get there and back. Here is Marcus's gear block reassembled. In a lucky check yesterday I found that the whole block could move horizontally by almost 1 centimetre! After removal we found the nut holding the block onto the axle has undone and so too had the locking sprocket end, meaning gear cogs were so lose they could actually spin backwards. All was fixed before Sunday and a little Saturday test cycle we declared all was good for Sunday. Here is the 10 year old and counting Condor racing cycle. This was due for pensioning 2007 but I hung on to it even in 2008 for a Bike with new Shimano Dura Ace componentry. Unfortunately I am still waiting. Marcus at the second refreshment stop in the forest. I've reluctantly put on the Cyclotour jersey since I read it was compulsory meaning I had to put some thermal arm protectors on. Why are cycling jerseys short sleeved anyway? Marcus says, smile we have finished and look at my lovely teeth. One of the disabled cyclists and his machine. Audi were sponsoring that team: but perhaps better tyre and wheel design is necessary. I saw 2 punctures across 4 machines. The post race, free Pasta queue was just too long. We carried those Defi cards with us for all those hours so that we can get our Super-Defi stamp for this event. Agata offers some post race prayers hoping she will magically be transported from race finish to home without any further cycling (i.e. all the way uphill ). Ah marketing! We are searching for a new GPS since our Garmin V is now considered an antique (offers anybody). Since I decided that car GPS units are freely available I thought just select a mid price model from our local computer shop. It was the Navigon 7210. It was marked as New (to their store) so I naturally assumed it was a relatively new model and therefore current. So after not much further very intensive Google research I was just about to press the order button when I noticed a Navigon 7310 for not much more. What had happened? Well sure, this product was indeed New to their Webstore, but actually probably on the way out in the marketplace. The advice of your tech savy (in this case GPS nerd friend) would have been useful. This used to be me, but I dropped the ball on GPS several years ago. Today (unlike in 2000 say) the Internet and Google and Youtube in particular makes it so easy to find product reviews and comparisons, that you would be a bit of a muppet not do just plod out to town and go for an Impulse buy. After a hurry up SMS from Rashida we made the journey south from home to the big Lausanne City centre in record time and with only 1 minute to spare took our places at the front to see a promising artiste Don Pinguino. In the first number of the set I was fascinated to hear a song about the Taliban. Later Agata managed to translate this chorus line to "Tout en Bien". I think this says it all about my current level of French. e.g In the USA it is claimed that each American man, woman or child owes $44,358 to somebody not in the USA. The clear idea is to show Americas that whilst their debts are high, well most other countries are still higher! UK (Britain) - just what were you thinking? Just who has all the money? So Intel has now gone public with its new CPU designs for 2009 / 2010. Which processor will you be choosing? For a domestic environment I would consider it likely that Nethalem-EX processors will sit on noisy multi-fan servers or proprietary form factor motherboards. So for reasons of noise I have a feeling my next server will be a more modest Westmere clad one. When I consider that the oldest working computer in the house is a Z-80 with about 7000 transistors, and that a Nethalem-EX has about 2.3 Billion transistors, well that is some rate of progress in just a few decades. You cannot imagine the countless hours I have spent on eBay looking for a reasonably priced OQO 1 and then OQO 2 miniature PC. The first OQO 1 shipped in late 2004 and the company was somewhat famous if not infamous for having demoed, talked and otherwise advertised its product over 1 year before actual delivery. 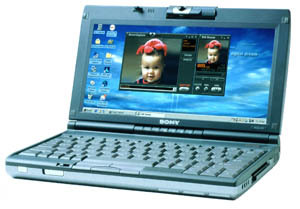 As the owner of several pocket sized PC's from the DOS based Mitac 1600A to the 486 Gateway Handbook (onto which I squeezed OS/2 Warp) to the Sony Vaio C1X (windows 2K) I felt the time was right to add another overpriced and underperforming laptop to my technology stable. But at the shockingly high price of all OQO hardware I would have been happy to have taken a rich kid's cast off. But it was not to be! Fellow eBayers seemed blissfully un-aware that any OQO sized device would come with massive usability compromises and always overbid. And then on May 14th 2009 I heard the tragic news that OQO had bitten the dust. I am guessing that their overpriced products now had some real competition from the still larger screen, faster and more capable Netbooks, which in 2009 have been springing up everywhere. Heck, a Netbook is now so cheap that if I accidentally went on vacation without a computer I might buy a Netbook as a temporary holiday laptop that I could "give away" to a friend on my return. The logical thing to do now of course is not to take the plunge on a late model OQO 2 micro PC even if it's somehow magically available "cheap" on eBay. With no more production, support or replacement parts it would be a risky computer purchase especially so for a carry everywhere PC. I keep saying to myself "Be strong". There was certainly a moment of silence and in retrospect sadness when our Dlink DGS1008 failed recently and went on its way to Silicon Heaven. I think she was tired of shipping the multiple daily Tera-Bytes (not Bits) of data around our principle home Gigabit Network and felt it was time for a permanent rest. What are the great features you should know about? Trunking allows you to assign physical links to one logical link (trunk) that functions as a single, higherspeed link providing dramatically increased bandwidth. This capability applies to connections between backbone devices as well as to connections in other network areas where traffic bottlenecks exist. So all in all money well spent and the only slight embarassment is that due to size limitations of our IKEA furniture we had to go for the 8 port and not the 24 port model. As middle age approaches the occasion of ones Birthday often changes from excitement to a cold sweat. Our local exhibition and events complex is now complete. But we have not seen any famous bands performing there just yet. My teeth are repaired, and it was so painless and fast! Marcus and Agata get some new boots! I am really quite excited to tell you that if you look at the above photograph ... you will see .... well some really healthy looking teeth! Reasonable prices and great availability. We are talking weeks not months. The private dentist system is full of young competent English speaking dentists who act very professionally. In the 3 principle areas that I have used them for, namely: Checkup and subsquent dental work e.g. new fillings, Replacement of Old fillings, Cleaning and flouride treatments. Well they have been truely excellent. On this my Birthday week Agata organised not one but 2 appointments. It is a significant story because: 20 years ago I was then lucky to escape my then second family dentist with some white composite fillings on my central front teeth. Lucky?, Well because the first family dentist had died (of old age) and he was a "drill and fill them" man. By this I mean filling with metal coloured dental amalgam! This newer dentist however contradicted my fathers amalgam suggestion, saying that "for your son to have some chance in future life, I'd suggest some white not metal coloured fillings". But pretty quickly these white fillings began to discolour and for some years now whenever I smiled you can see these stained areas on my front teeth. My Polish dentist has been recommending their removal and replacement several times now. So on this Birthday week I agreed for him to go ahead. What were the results? Everything went so smoothly, painlessly and quickly I feel like a total muppet for not having this done earlier! It took only 40 minutes or so to remove the old fillings and a short time to put the new ones in. To repeat, I am totally astonished at how painless and quick this procedure was and now my front teeth are absent of all blemishes! It is absolutely fantastic. Just before the sand cleaning, and quite the funniest photograph I have ever had taken of me. I am still smiling! So the moral of this story is, when you find a good dentist, regular visits to them are actually fun and not a pain. In Poland, there is the added bonus that the cost will not burn a hole in your pocket either.